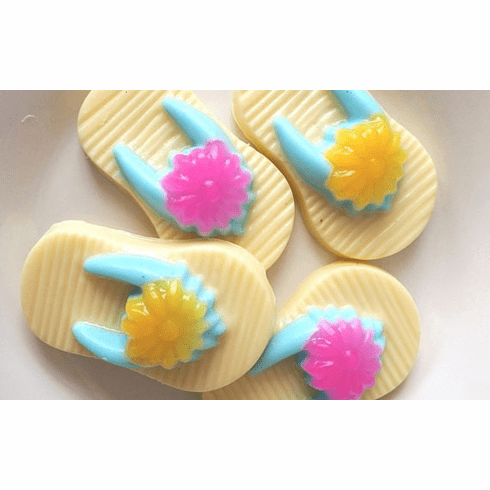 These adorable soap sandals will make a splash at any event! Great for a beach-themed wedding or any summer party. Each soap weighs approximately 1.5 ounces and you will receive half of the soaps with a yellow flower and half with a pink flower and all with a blue strap. The measure approximately 3 1/4 X 2 X 1 inches. Our default scent for these is tropical breeze but you can choose a different scent below. They each come individually packaged in a clear bag and a matching raffia ribbon and cardstock tag. Please let me know at check out what you would like on the tag. Made with 100% vegetable glycerin soap that is detergent free and vegan friendly. IF YOU NEED A DIFFERENT AMOUNT, PLEASE CONTACT ME. Depending on the size of your order, lead time will be about 2-6 weeks. Due to the nature of the product and because these are made-to-order, we do not accept returns on these.